The New Jersey governor has officially entered the presidential race, and at this point all we can hope is that we never see a Chris Christie and Donald Trump debate. The first Republican candidate showdown comes in August will be hosted by Fox News, which will only allow the top 10 polling candidates to participate. Many laughed off Trump's ability to even get that far ahead in the race, but now it's looking possible. Recent polling numbers show Trump ranking second in popularity with 12 percent, right behind front runner Jeb Bush, who is currently polling at 19 percent. 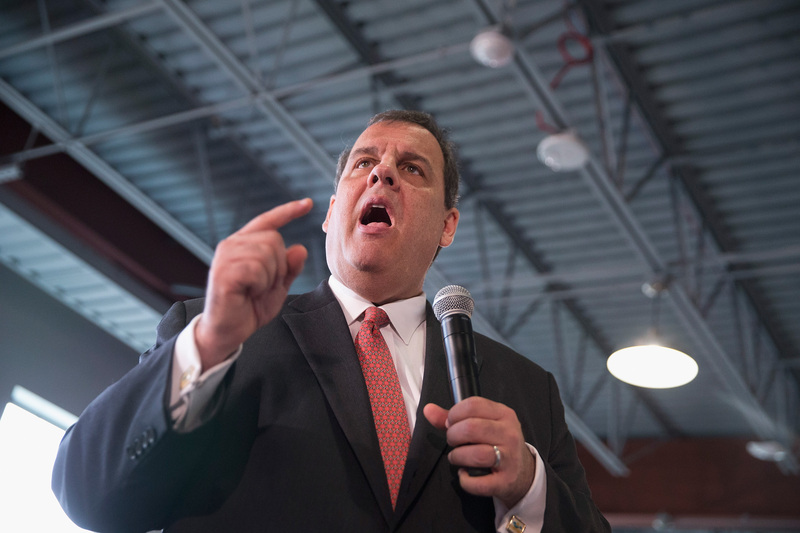 Christie, who announced his candidacy Tuesday, lags behind at 3 percent. However, there are several candidates behind him, and his campaign is brand new, which means he could potentially pull ahead in the coming months. But let's be frank: Seeing both Trump and Christie on a stage together could be way too much. Although Christie has a long history of being blunt, loud, and brash, both candidates have built their campaigns around the theme of "telling it like it is." Neither are pulling punches, and they're both playing it fast and loose — literally. Both candidates announced their campaigns with forceful, unscripted speeches that ranged from humorous to barely being factual. So what would this debate look like? With these two men, it's very hard to predict their next moves, but there are at least a few things we're pretty sure of. Since getting involved in politics, Trump has been proving that he does not need help from microphones in order to be heard. And no one can forget the videos of Christie screaming at town hall events across America. There is absolutely no doubt that such a debate would yield a stage full of red-faced contestants, struggling to be heard over the din. Trump has no problem being blunt about his belief that everyone in the political arena, including the president and people in wheelchairs, are "losers." Christie takes a similar approach, with his notorious habit of using obscure insults. His favorite diss is to call his opponents "numb nuts," closely followed by the ever colorful "ignoramus." Okay, I admit, this is a bit of a cheap shot. Admittedly, Christie's haircut is fine (and a haircut does not a good president make), but have you ever noticed that it literally trembles when he starts to get worked up? It's actually extremely distracting to watch. Also, Trump's hair needs no explanation. It's no secret both of these men tend to go on tangents. If they met each other during a debate, it's likely that the excitement of the night would cause them to lose their train of thought and ramble. One possible subject they might land on is music. Why? Well, both men are really passionate about music. Christie has attended over 130 Bruce Springsteen concerts (yes, really), and Trump used to enjoy talking about his love of Neil Young. However, since the singer snubbed him, it's unlikely a Young-related rant would be complimentary toward the Canadian folk-singer. Maybe the two candidates would bond over this; Christie also got mocked by his hero after his infamous "Bridgegate" scandal. A Christie-Trump debate is sure to be a circus, hands down. But it also could be shockingly good for the GOP. Honestly, the other candidates could stand there in silence for the entire duration of the debate, and it would be the best PR the GOP has had in a while. By comparison, each candidate would look like a responsible, level-headed genius.